Manufacturer of a wide range of products which include jcb earthmover shoes, jcb power safety shoes and jcb trekker safety shoes. Light Weight Black 4 Eyelet. Full Grain Textured Leather Upper. 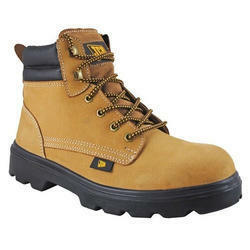 Imported 200J, EN12568 Steel Toe Cap. Quick Sweat Absorbing Mesh Lining. Heat Resistant - 150°C.Oil & Chemical Resistant Antistatic Sole. Direct Injected Double Density PU Sole. EN ISO 20345 & IS 15298 (II).